Don’t worry. Everything is under control now. 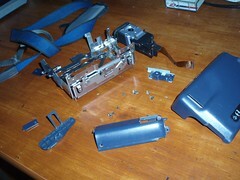 All it took was a little bit of…well, a LOT of finagling and WAY more effort than the average consumer would ever want to put into a clearly broken piece of equipment. After SEVEN years of faithful service, including an intensive year and a half long period of travel crammed into a tiny backpack, my little old Sony Digital8 camcorder finally gave up the ship and shuffled off into that Japanese consumer electronics scrap heap in the sky…kinda. I powered up the ol’ champ to get some footage of Arizona (the puppy, not the state) playing in her pool (hmm…I wonder how much I could get for footage of the state of Arizona playing in a pool) and it wouldn’t do anything but turn on and off and play the tape already in there. 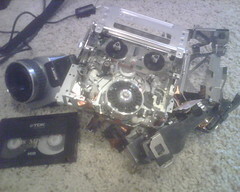 It wouldn’t record and most importantly it wouldn’t eject the tape. I really wanted that tape. 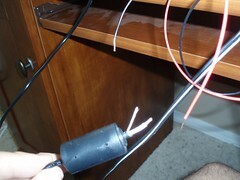 Since cutting up the charger and attaching the bare wires directly to the little motor on the death cage that the tape was trapped in seemed to pop the sucker right open I suddenly had newfound hope! Maybe this pile of scrap hadn’t outlived its usefulness after all! After some quick soldering to extend the contacts outside the case I put the camera back together and now I can use it to transfer all the footage from my TALES FROM THE VAULT adventures to Charley so new videos can once again return to these pages! (All I have to do is plug the charger into the wall and use its exposed wires to either open or close the cage depending on the polarity while holding the camera just right.) Yay! And I hardly had any extra pieces! 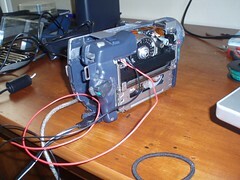 Good hack, guess it just needed a little defibrillation. Hhe article's content rich variety which make us move for our mood after reading this article. surprise, here you will find what you want! Recently, I found some wedsites which commodity is colorful of fashion. Such as mbt outlet store that worth you to see. Believe me these websites won’t let you down.